Nearly everyone knows the Bible story about the three wise men who took gifts of frankincense, gold, and myrrh to baby Jesus. For many, the story is our earliest memory of (and sometimes only reference to) the word “myrrh.” Not many understand the particular significance of these gifts. This article will explain why myrrh essential oil in particular was such a valuable gift, as well as some of the wonderful healing qualities myrrh has to offer. Myrrh and frankincense both come from the plant family known as Burseraceae. They are trees which tend to grow best in the poor soil conditions of Somalia, Ethiopia, Yemen, and Saudi Arabia, although they also grow in other parts of the world. To create myrrh essential oil, first the bark of the tree is cut. The tear-shaped droplets of resin that leak out are given time to harden and then scraped off the trunk of the tree. Once harvested, the resin is then steam-distilled to create myrrh essential oil. Although frankincense and myrrh are often mentioned together (and they do come from the same plant family), they have quite different aromas. The aroma of myrrh, for someone who has never experienced it, can be described as earthy. More medicinal than frankincense, with hints of bitter, spicy, and musty notes all combined. There are dozens of species of myrrh, but only a few have been studied for their therapeutic properties. Most commonly used are Commiphora myrrha (also known as Commiphora molmol), Commiphora guidotti, and Commophora wightii (also known as “guggul” in the traditional medicine of India). Myrrh is mentioned many times in one of the oldest known medical texts, the Ebers Papyrus. The text dates back to the 16th century B.C. and is a treasure trove of ancient Egyptian prescriptions and recipes. The Egyptians even used myrrh as part of the embalming process. Myrrh was mentioned more frequently than any other plant in Hippocrates’ medical writings in the fourth and third centuries B.C. Both the Old and New Testaments mention myrrh frequently. Hildegard von Bingen, the famous German abbess and herbalist (1098-1179), used myrrh in some of her healing medicines. The people of the Middle East and North Africa have a long tradition of myrrh use. For nearly five millennia, myrrh has been utilized as incense, perfume, an insect repellent, and in healing salves for sores and wounds that won’t heal. It has also been used in rejuvenating skin treatments (it’s great for wrinkles), for indigestion, bad breath (the resin is chewed like gum), bronchial infections, and even hemorrhoids. Myrrh has been used from ancient times right up to the present day in traditional Chinese medicine for many and varied health concerns. It was worth more than gold in ancient times! Why Did Myrrh Fall Out of Favor? Despite the wonderful healing qualities of myrrh and frankincense, they both fell out of favor when the Roman Empire fell, and with the rise of Christianity. The burning of incense was forbidden in the early years of Christianity because of its association with pagan worship. This destroyed a thriving trade in both frankincense and myrrh that had developed over hundreds of years. Later, some denominations (particularly the Catholic Church), resumed the burning of these aromatic resins during specific rites. 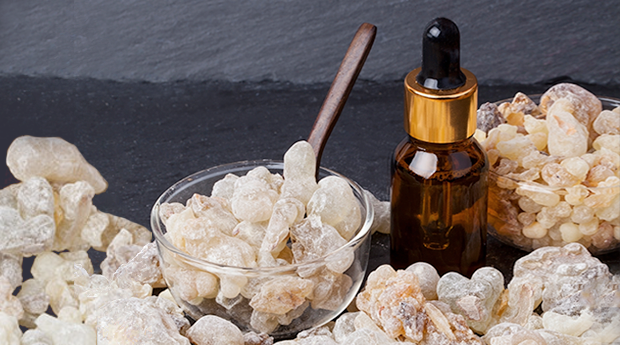 Recently, so much research has been carried out on both frankincense and myrrh, it is doubtful that we will ever ignore their amazing therapeutic benefits again. The scientific studies that have been carried out on myrrh have proven it has antioxidant, astringent, anti-tumoral, anti-inflammatory, anti-fungal, anti-parasitic, antiviral, and analgesic (pain relieving) benefits. Without getting too heavily into the chemistry of essential oils, two of the most active compounds found in myrrh are known as terpenoids and sesquiterpenes. Inside the body these two compounds have some vastly interesting functions. They are highly anti-inflammatory, and potent antiseptics. Sesquiterpenes also have one more wonderful quality − they have the ability to cross through the blood-brain barrier. This means they can influence the brain by passing from the blood into the brain. The blood-brain barrier is an extremely secure and selective tissue barrier. It protects the fragile tissues of the brain and central nervous system. The blood-brain barrier only allows certain compounds to pass through it − things that are necessary for brain function. Research has demonstrated that certain sesquiterpenes in essential oils can cross the blood-brain barrier because of their small molecular size. They stimulate the limbic system of the brain, which is the center of emotions and memory. They also stimulate the hypothalamus (known as the master gland), pineal, and pituitary glands. Sesquiterpenes have a wonderfully calming and balancing effect on our emotions and nervous system. Inflammatory Bowel Disease – Saudi research published in the Journal of Experimental and Therapeutic Medicine in August 2016 investigated the effects of myrrh on mice with ulcerative colitis, an inflammatory bowel disease. The myrrh worked as well as a commonly used drug, mesalazine, due to its antioxidant and anti-inflammatory properties. Myrrh also helped to protect against ulcerative colitis. Anti-Bacterial, Wound Healing – Joint research performed by Indian and Malaysian scientists, published in May 2016 in the Open Dentistry Journal found that myrrh was a potent anti-bacterial. Researchers stated that myrrh worked as well for eliminating oral bacteria as chlorhexidine, a much-used antibacterial agent, in the treatment of dental bacteria. Myrrh also worked better than licorice or neem, the other two substances studied. The problem with chlorhexidine is that research indicates it increases the risk of heart attack, raises blood pressure, and kills off the good bacteria that help blood vessels relax. The use of myrrh is not associated with these risks. Joint Sudanese and Malaysian research on myrrh published in 2009 found that it had antibacterial activity against several strains of Staphylococcus aureus and MRSA (Methicillin-resistant S. aureus), two virulent strains of bacteria which are defeating modern antibiotics. British research reported in the journal Phytotherapy Research in October 2008 found that myrrh made the commonly-used antibiotic drugs ciprofloxacin and tetracycline more effective against Staphylococcus aureus, several Salmonella strains, and several other bacterial strains. Anti-Fungal – Iranian research published in Pharmaceutical Biology in October 2015 found myrrh to be helpful for fungal skin infections. Serbian researchers also discovered that myrrh (along with frankincense and elemi essential oils) is a potent antifungal agent. The research, published in May 2016 in the Experimental and Clinical Services Journal, found that the phytochemicals (natural plant chemicals) in these oils had strong effects against Candida albicans, as well as 60 other fungal strains. Since an overgrowth of fungus in the body can often be a prelude to cancer and other diseases, this is great news. Anti-Tumoral – Welsh researchers, in a study published in Phytotherapy Research in March 2016, found that a phytochemical from myrrh known as beta-bisabolene showed cytotoxic (this means toxic against cancer cells) activity against four lines of human breast cancer cells. Amongst these are triple negative and HER2 positive breast cancers, both of which tend to be more aggressive forms of breast cancer. American research published in the Journal of Natural Products in November 2001 discovered six sesquiterpenoids in myrrh resin, one of which had cytotoxic activity against MCF-7 breast cancer cells. This line of cells is estrogen-receptor positive (ER+) and progesterone-receptor positive (PR+), infiltrating ductal carcinoma with metastases. This same cell line was investigated in Chinese research reported in October 2013 in the journal Oncology Letters. These researchers found that myrrh worked better than frankincense on MCF-7 cancer cells. They deduced it was the phytochemical beta-elemene in myrrh that induced apoptosis and provided anti-tumor activity in these cells. Saudi research on mice, appearing in the Chemotherapy Journal in September 1994, found that the antitumor effect of myrrh was comparable to the standard cancer drug cyclophosphamide. Research reported in the Journal of Medicinal Plants Research in April 2011 found that myrrh reduced the proliferation (this describes the ability of a cancer cell to grow and spread) of human cancer cells in eight different cancer cell lines, particularly gynecological cancers. Antiparasitic – A small study reported in August 2001 in the American Journal of Tropical Medicine and Hygiene investigated seven patients who were passing Fasciola eggs in their stools. These patients were treated with a “drug” formulation that consisted of eight parts resin and three-and-a-half parts volatile oils, all extracted from myrrh. The Fasciola eggs were no longer detectable in the feces three weeks after treatment. Researchers concluded that the formulation was safe, well tolerated, and effective for treating fascioliasis. Analgesic, Anti-inflammatory, Anti-hyperlipidemic – It is known that myrrh has been used for thousands of years for its excellent pain relieving and anti-inflammatory benefits. Egyptian researchers found it did all that and one more great thing. An Egyptian animal study published in 2014 in the Journal of Intercultural Ethnopharmacology found that myrrh had significant pain relieving and anti-inflammatory actions. Interestingly, myrrh also normalized high levels of blood lipids in obese rats! 1. Inhalation. 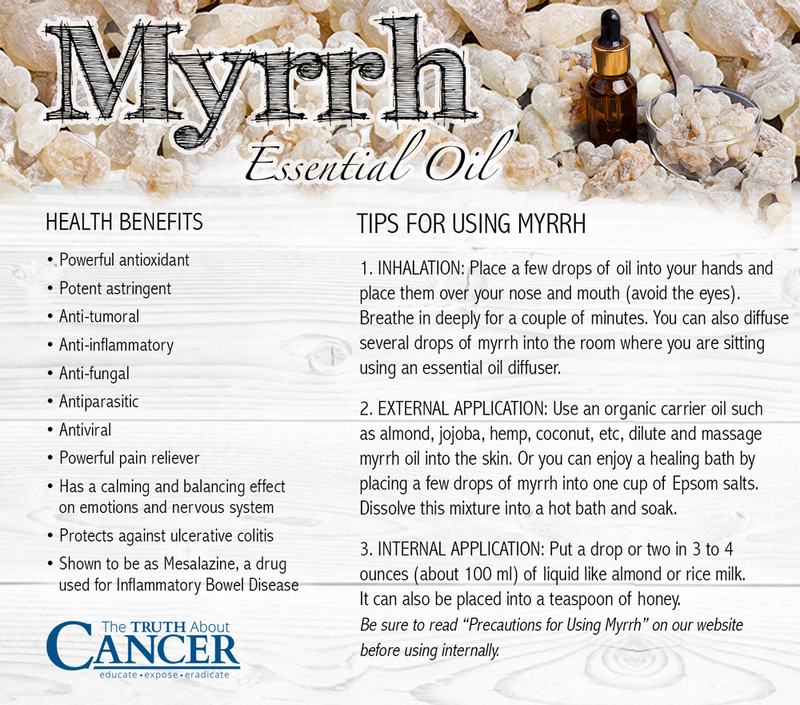 Myrrh provides wonderful relief for upper respiratory infections. Just place a few drops of oil into your hands and place them over your nose and mouth (being cautious to avoid the eyes). Breathe in deeply for a couple of minutes. This method is one of the best ways to get the essential oil into your bloodstream and working. You can also diffuse several drops of myrrh into the room where you are sitting by using a cool mist ultrasonic diffuser. It is best not to heat essential oils as this can ruin some of their therapeutic benefits. 2. External Application. Using an organic carrier oil (e.g. almond, jojoba, hemp, coconut), dilute and massage myrrh oil into the skin. You can also add a drop or two of myrrh to your favorite organic cosmetic and personal care products such as body wash, cleanser, moisturizer, toner, shampoo, or conditioner. Additionally, you can enjoy a healing bath by placing a few drops of myrrh into one cup of Epsom salts. Dissolve this mixture into a hot bath and soak. 3. Internal Application. Myrrh essential oil has been deemed to be safe for human consumption by the United States Food & Drug Administration (USFDA). To take internally, put a drop or two of oil in three to four ounces (about 100 ml) of liquid such as almond or rice milk. It can also be placed into a teaspoon of honey. Be sure to read “Precautions for Using Myrrh” below before using internally. Children under age five. In older children, be sure to dilute heavily. Diabetics should avoid myrrh as it may have an interaction with diabetes medications. People undergoing surgery − it is best to stop using myrrh at least two weeks prior to surgery. Anyone taking anti-coagulants such as Warfarin because myrrh may have an interaction with this medication. Taking high doses can have possible side effects so it is unwise to do this unless you are working with a knowledgeable healthcare practitioner. It is not advisable to use any essential oil as the sole treatment for cancer, or for any of the other health issues mentioned in this article. When used in conjunction with other conventional and alternative medical treatments, however, essential oils can be effective in helping the body heal. Most people have likely heard of “myrrh” from the Bible (one of the gifts the 3 Wise Men gave to baby Jesus), but not many understand why myrrh essential oil in particular was such a valuable gift, as well as some of the wonderful healing qualities myrrh has to offer. Myrrh and frankincense both come from the same plant family of trees. To create myrrh essential oil, droplets of hardened resin are scraped off the trunk of the tree and steam-distilled. In addition to being mentioned in both the Old and New Testaments in the Bible, there are references to myrrh in many of the oldest known medical texts. For example, myrrh was mentioned more frequently than any other plant in Hippocrates’ medical writings. 1. Inhalation – Myrrh provides wonderful relief for upper respiratory infections. 2. External Application – Using an organic carrier oil, dilute and massage myrrh oil into the skin. 3. Internal Application – Myrrh essential oil has been deemed to be safe for human consumption by the FDA. To take internally, put a drop or two of oil in 3-4 ounces (about 100 ml) of liquid such as almond or rice milk. Be sure to read “Precautions for Using Myrrh” in the article before using internally. Is Nitric Oxide a Cancer-Healing Powerhouse? Zinc Deficiency & Cancer Growth: What’s Your Risk? This is an interesting article. I heard of myrrh in the Bible. I did not think that they used myrrh essential oils in the 21st century. Which stores have myrrh essential oils in Canada and do they have to be Young Living? doTerra sells many types of essential oils including myrrh. Rocky Mountain Essential oils are great and not overly priced like doTerra and Young living. Get them online – great customer service. I love deTERRA oils the only one with enough research, and knowing its 100 percent oil and stands behind its products.. the only one that will go into my body.. My oncologist said to stay away from other copy cat oils.. I have stage 4 cancer; breast and I use myrrh carried in fractionated coconut on my breast wound. It is working wonderfully. and I use ameo essential oils by Zija because they are therapeutic grade. Young Living have the highest Quality Essential oils out there. I’ve done a lot of research to find the Best! Just started buying them regularly and they are AMAZING!!! In my mouth, in my bath, in my water bottle(glass water bottle), in the air I breath at home(diffuser), in my necklace (to have real close!) , and in a spray bottle mixed with water to clean and disenfect my house, car ect. No need to buy expensive chemical cleaners anymore! And the house smells AMAZING! Oh yes, I dont buy expensive perfume anymore either! Lemon,peppermint, citrus or choice of so many more! I LOVE LOVE LOVE these OILS!!!! I order my Myrrh from Amazon I get an ounce of it once every 3 years approximately, that’s how very sparing you can use it. My mother had arthritic fingers that would not stay flexed at all and it hurt intensely to uncurl them with her other hand opening those fingers, I put myrrh on her fingers and the next morning she was screaming like crazy i flew out of bed to see what was wrong, but it was all right! She could flex and bend her fingers no problem first time in two years. She only needs to massage one drop every 6 months or so, and no longer has that problem. It is amazing for arthritis! i have used it for abscessed teeth, I cannot tell you how many uses I have found for this God sent product! There are other companies that sell it much cheaper, and with GC/MS reports that prove purity. Plant Therapy, Rocky MTN Oils, Aromatics International. You don’t have to get involved with MLM companies. I HAVE GETTI FUNGUS PROBABLY IN LIVER. I WILL BUY MYRRH, MIX 4 DROPS WITH SPOON OF COCONUT OIL AND MIX BITS IN MY MOUTH WITH OJ. SHOULD GO TO LIVER AND CLEAN THE PARASITRE OUT. Two more good essential oil vendors are Eden’s Garden and Rocky Mountain Oils. So I take 25 mg of Metaprolol twice a day and 5 mg. of Lisinopril 1X day for heart meds. Are these considered to react with Myrhh? What about Frankincense? I take one drop a day on my tongue for cancer prevention and some is mixed in a night face cream I make. Is the article saying I shouldn’t use Myrhh? I looked up your heart medications and neither of them are blood thinners, so as the article listed Warafin type medications ( blood thinners) as a contraindication, you could use Myrhh. Frankincense is slightly different, it would be good to research it further.There was a TTAC article about Frankincense posted some time ago. Naturopathic Doctors have a lot of knowledge about ways to manage high blood pressure. It could be worthwhile for you to have a consultation. Best wishes. Hey Ty! I burn Frankincense! 3x daily. I ??? it. Im going to buy some Myrrh today and infuse it with my Frankincense. Thank you Again!!! and may God!!!?? continue to Bless You! and you’re Family. ✌️??? Thank you. I found this article very interesting. I intend to check and see were I can buy it. We are going forward to the past. An interesting and informative article. It seems that the answers are in nature itself. I wonder if it could be used to trea my lipoma. This is what is confusing. I read that almond milk Etc was not a good milk for the body. Why would I use it to mix the myrhh? almonds. It is mostly water, sweetener, added vitamins and a few almonds. The best almond milk would be home made. This home made drink would make an excellent carrier for myrrh to be ingested. You can put it in a veggie cap with a few drops of coconut oil instead. That’s how we take it. Who said that almond milk is bad for the body? and what does Etc. mean?I know nothing about Myrrh but I know even less about almond milk being bad for health Please give me some help. If you make almond milk from scratch – there is little problem…..other than the fact that the FDA forces all almond growers to irradiate the product before being sold, unfortunately. The issue with almond milk sold in stores, is, very few almonds are actually used, and the liquid includes various additives – particularly carrageenan as a thickener, which has been shown to cause liver damage and is considered carcinogenic. (This additive is in yogurts and most ice cream, as well.) Cold-pressed coconut oil is a FAR better alternatives! Silk Almond milk is non GMO,dairy free, lactose free,soyfree, carrageenan free,no saturated fat,no artificial anything, and it tastes good. may God bless you.people like you are working so hard to unearth treasures of knowledge for benefit of ailing mankind.Awonderful and extremely educative article. I mix it in my body butter along with frankincense. For cancer prevention, I’m thinking of taking them both in a capsule. It is very irresponsible for this author to suggest that the consumption of myrrh(or any other ) essential oil is safe by FDA standards. Since when is the FDA authority on natural products? Where are the long term studies on the effects of consumption of Essential Oils? The oils are massively concentrated and this author believes it is safe to ingest up to four drops???? Beware of anyone who suggests this. There is no evidence of the safety in doing so. Well GC? I have ingested it many times!!! I have had stomach virus and ingested it and within 20 minutes that stomach virus was gone!! Century upon century the people of the middle east know and have used Myrrh for all that ails you. Why so upset over someone knowing the uses of this product? You may not know but anyone who does any amount of strong in depth studying knows all the uses and effects of this oil. When I was sick with cancer several years ago I used the doTerra essential oils and others of therapeutic quality with good results. Methods used were ingestion, inhalation, and application to the skin, including the soles of the feet which are especially porous. When I ingested oregano and frankincense I used fractionated coconut oil with them in capsules. In my personal opinion, if the essential oil is of high grade, as in Doterra, it’s safe to ingest small amounts. Young Living Essential Oils are the ONLY ones safe for ingestion. Please do your research. Check out their Seed to Seal promise. Perhaps we all need to review the Bible! There were 3 gifts, not 3 wise men! God has provided, in His providence, for our healing, both our never-dying soul and our physical body. That being said, MountainRoseHerbs would be a very good choice for these oils. They are very intensively involved in the safety of their products and you might find reading about their procedures on their site to be pleasing. I usually (not always) find that people who suggest oil consumption are people from oil companies like PLANT THERAPY where they say in order to belong to their groups that you cannot endorse any oil consumption. Not only does that make me leery of their oils, that they are synthetically or cheaply made even though they claim they are FDA approved now and 100% pure, but obviously don’t know the safety and benefits highest quality oils like DOTERRA and YOUNG LIVING. Have you seen the TTAC cancer videos where oils are talked about to kill cancerous stem cells? I am only trying to inform you in case you don’t have all the facts. For any questions, ask their doctors available for consult from the video website if you want to know the answers. Hi Elizabeth, I know it has been awhile since the post above, but to get the oils to be most effective you shouldnt burn them, Heating them cooks away the effectiveness. Try a diffuser. Much better. I thought that it was interesting that this could be anti-inflammatory and a potent antiseptic. My friend was telling me that I should think about using myrrh oil to help me with some of the pain that I’ve been having. I think that I will continue to look into it, but I hope that it will end up working well for me. Hi and thank you for the wonderful series! Only one question regarding quantities: how many drops of each Myrrh and Frankincense in how much carrier-oil or cream as treatment? Hi! I use Plant Therapy Myrrh and I buy the jojoba carrier oil and the coconut carrier oil from there too! I mix it with the Tumeric Co2! They totally work together reducing all swelling and dull pain from breast surgery. It breaks apart tissue that is abnormal and somehow restores it and makes all the pain go away! I love it so much! I have bottles of each ingredient and mix and make it for my friends as well! what is the tumeric Co2? is that an oil you get also? I may be going for breast surgery soon and would like something to make me feel better. 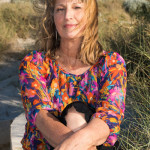 Did you watch the Global quest of the Truth about Cancer lady? Chemo is deadly for humans. 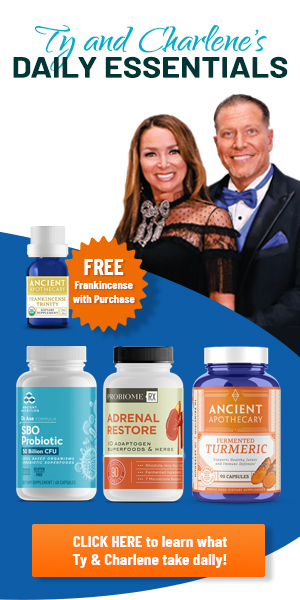 no need when there is no many other natural alternatives like frank and myrrh. this for real works wonders. watch the quest my advice!